How does an institution encourage reporting of instances of sexual harassment? What does it do when it receives such reports and how does it respond if sexual harassment occurs? 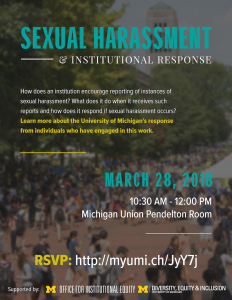 Learn more about the University of Michigan's response from individuals who have engaged in this work. - SPEAKERS: Susan Gelman, Bruno Giordani, Tim Wood, Pamela Heatlie and Kaaren Williamsen.